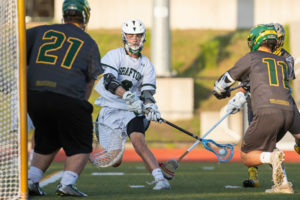 Grafton – The Grafton High School Indians boys’ lacrosse team defeated Tantasqua Regional by a score of 12-3 in a game played May 29. 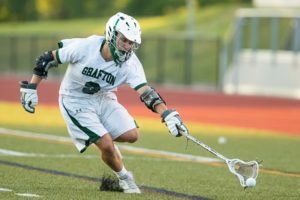 Grafton claims the Mid-Mass Lacrosse League title, and is looking forward towards another deep playoff run, after having reached the State Division 3 finals the past three years. 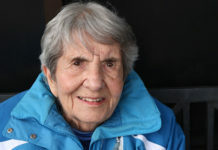 Steve Rotatori scored 3 goals for Grafton while Johnny Malloy and Jack Gurney each scored twice. 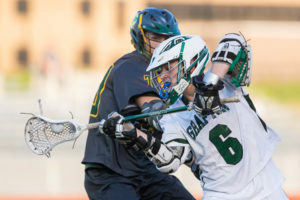 With the win, Grafton improves to 12-5 on the season, while Tantasqua falls to 11-6. Grafton’s Steve Rotatori maneuvers to keep the ball away from a Tantasqua defender. Grafton’s Jack Gurney lunges to snag a ball just before it bounces out of bounds in a game against Tantasqua.